Business agility (along with business-IT alignment) is often touted as one of the key benefits of SOA. The problem is that more often than not no explanation is given for what business agility actually is, why it is important, or how SOA contributes to achieving it. Firstly, it is important to note that business agility is a relative goal as opposed to an absolute one. Even the most agile business can strive for greater agility. So what is business agility? Business agility is the degree to which an organisation can effectively innovate and respond to market forces. In any given undertaking within an organisation, there are the traditional project management constraints of time, resource, scope and quality. For a fixed scope if we wish to decrease time to delivery, we must increase resource or decrease quality. For fixed resource if we wish to decrease time to delivery, we must decrease scope or quality. Note that scope refers to the amount of work that needs to be done to deliver the agreed outcome. But as always, there is more than one way to skin a cat. The business objectives targeted by the project can be met in any number of different ways. A talented Solution Architect can design a solution to a business problem that requires less work to deliver. Really what we are talking about here is contrasting business value with effort. If an organisation has a highly complex IT architecture that is very tightly coupled with a large number of interdependencies, then a change will take more effort to achieve, but deliver the same business value. In order to have an agile organisation, we must have the ability to enact change with less effort. SOA helps simplify the IT architecture of an organisation by making systems more loosely coupled. Of course, there are varying degrees of loose coupling with different SOA implementations. The SOA architectural style reduces coupling through message based interactions conforming to explicitly defined service contracts that encapsulate the implementation details of services away from consumers. This gives us the ability to make changes to service implementations without impacting their consumers. We reduce coupling further by designing our services with appropriate granularity and cohesion, based on publish-subscribe messaging with stable service contracts. 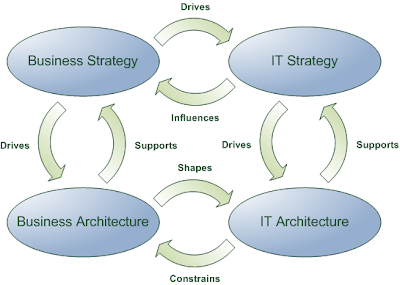 The IT architecture of an organisation however is only one piece of the business agility puzzle. Once a business need has been identified, the business requirements must be extracted. The speed, efficiency and accuracy with which this activity is performed also contribute to business agility. There is very little business value in delivering a solution that doesn't meet the identified business objectives. Furthermore once we have extracted our business requirements, assuming they are accurate, we need to produce a solution architecture that meets those requirements. So an organisation's proficiency in Solution Architecture is also significant here. We also want to ensure that as each solution is delivered, the complexity of the business and IT architecture is not adversely affected. As such, we need the proper architecture governance processes in place to protect the broader enterprise architecture. It is important to strike the right balance with governance however. Inefficient governance processes slow the rate at which projects can be delivered, thus harming business agility. Insufficient governance however will result in the gradual increase of architectural complexity, thus harming business agility in the long run. Simply developing an effective solution architecture is still not enough. We must of course then go about implementing the solution. Here, the effectiveness of the organisation's project and programme management function is relevant, as well as the proficiency of the people that build and deploy the solution. And finally once the solution is ready to deploy, there must be effective change management processes in place to ensure that affected workers are properly trained and informed to support the change. If the solution is not embraced by the people it affects, then the change will be ineffective. So why all the fuss about business agility? Simply put, an organisation that doesn't respond to its changing environment will eventually become uncompetitive. Granted that some industries are more volatile than others, however all business environments change over time. Those businesses that are able to embrace this change in order to generate competitive advantage will be more successful. Innovation is also a key consideration in generating competitive advantage. The ability to be able to take an idea and turn it into reality in less time, with less cost and lower risk certainly generates competitive advantage. So in conclusion, SOA as a style of architecture contributes towards business agility through reduction of enterprise architectural complexity, but by no means guarantees it. So far I've posted a large amount of material on SOA, pushing very heavily for an event driven approach - with specific attention to business services, where business-relevant events are surfaced as event messages published over a service bus. There has been an ongoing discussion in the public forum around the relationship between SOA and EDA (Event Driven Architecture). Are they in fact separate architectural styles? Are they separate concerns? Do they complement each other? Does SOA subsume EDA? 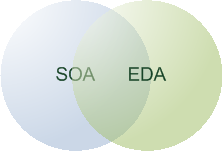 SOA and EDA are in fact separate architectural styles. However they describe different concerns of an architecture. They each bring their own benefits. As such, it is possible (and in fact good practice) for the two styles to overlap. An architecture can indeed both be service oriented and event driven. Likewise it is possible for an architecture to be service oriented but not event driven, or event driven and not service oriented. This is illustrated below. An architecture consisting of services with no endpoints with a publish-subscribe binding conforms to the service oriented style of architecture, but is not event driven. An architecture consisting of messages published over topics, but where there is no notion of services is event driven, but not service oriented. For example, EAI can be achieved by having a number of applications publishing and subscribing over a set of topics, without explicitly defining any services, endpoints or service contracts. Where SOA and EDA come together, a topic corresponds to a specific endpoint of a specific service. A topic cannot be shared between endpoints or services, and messages published onto a topic must conform to an explicitly defined service contract. SOA brings benefits to EDA and vice versa. Therefore we get the best result when the two architectural styles are combined. In my last post we talked about service composition in SOA. Miguel posted a good question about whether composition in SOA is analogous with composition in Component Oriented Programming. This really got me to thinking about whether composition actually has any real meaning in SOA at all. One of the key differences between components in Component Oriented Programming and services in SOA is that components must be instantiated. A client must instantiate a component before the component is used. Furthermore, multiple instances of a component can and usually do exist at the same time. Composition makes a lot of sense in Component Oriented Programming because we have one or more child components supporting a parent component. Every new instance of the parent component contains new instances of the child components. Without instancing, composition wouldn't really make a great deal of sense in Component Oriented Programming. Just because a component uses or references another component, doesn't make those components a composite. What makes a set of components a composite is the lifetime of the child components being indelibly tied to that of the parent component. The children are created with the parent and destroyed when the parent is destroyed. The children have no purpose other than to meet the needs of the parent. SOA is a different ballgame however. There is only ever one and only one instance of every service. All services for all intents and purposes are always running (except for the odd moments of downtime) until those services are retired. So what is a composite in SOA terms? If I have a service A which consumes services B and C, is A a composite of B and C? I would say no. Otherwise all services in our enterprise would simply one big composite. I would suggest that composition in SOA refers to the bringing together of lower level services in order to support one or more higher level services. It seems we need to have services at different levels in order for composition to make sense in SOA. So if services B and C are lower level services that form part of the implementation of service A, then I would say that services B and C have been composed to form service A. As I mentioned in my last post, with all the hype around Layered Service Models, where lower level services (like task and entity services) are composed to form higher level process services, we see service composition taking centre stage in SOA discussions far more than it really should. As I've previously discussed, the type of reuse central to Layered Service Models (functional reuse as opposed to reuse of events) doesn't really work very well in practice. Functions exposed at the service level generally are too coarsely grained to be reused in different contexts. As such, the notion of having a registry of lower level services that can be composed together in support of higher level services is somewhat flawed. We may have lower level services such as integration services, UI services or B2B services that support a higher level business service, but those lower level services should not be reused between the higher level services. As such, in this case the service composition is really just an implementation detail of the higher level services and as such not really architecturally noteworthy. So I say again, service composition in SOA is only really a noteworthy concept if you're pursuing a Layered Service Model which as I've said before is not ideal. Quite often we hear of service composition as one of the key benefits of the service oriented style of architecture. With service composition, we are referring to the creation of new services from wiring up of existing services in new ways to deliver new value. According to the standard reading material, service composition is best achieved through orchestration. This is usually achieved through the use of middleware such as an ESB or integration broker. A workflow orchestrates the invocations of a number of services in order to achieve some particular outcome. As such, we find that a service may comprise some of its own logic (including the orchestration logic), as well as a number of lower level services. This concept of service composition is central to the Layered Service Model where lower level task and entity services are composed into higher level process services. As you will have gleaned from my previous posts on the topic, I'm not a supporter of the Layered Service Model approach. One of the issues of this approach is that lower level services are reused by many higher level services, resulting in high coupling between those higher level services. In the past, I have highly recommended that people pursue what I call a Self-Contained Process-Centric Service Model. Here, services are centred around autonomous business functions such as Sales, Marketing and Billing. What I probably didn't emphasise about this approach however is that it refers only to the top-level service model. Each business service may be composed of lower level services. Note that these lower level services are not business services. They are services that serve a particular function in support of the business service. They are an implementation detail of the business service. In fact, they are actually really just distributed components or integration points. However if the means of communication with the distributed component or integration point is the exchange of messages via endpoints in conformance with a service contract, then we technically have a service by the strict definition of SOA. In a green fields implementation where the software supporting each business service is built from scratch, there may be no lower level services involved. That is, there is no service composition. Alternatively, the service software may be implemented with a smart client application that interacts with some back end components via the exchange of messages in conformance to a service contract. Thus, those back end components technically expose a service to the smart client application. Say in support of this business service, the back end components also interact with a Web service provided by another organisation. Now we have another service added to the mix. Here we can see services being composed in support of the larger business service. Where a business service is supported by a number of legacy applications we see even more composition. When the business service receives a message, it must invoke one or more of these legacy applications appropriately. This may be achieved by invoking Web services exposed by these applications, thus constituting further service composition. So we see that services certainly can be composed in support of larger services. However I would hesitate to name this as a benefit of the SOA style of architecture. It is merely an implementation choice of any given service. Service composition has only come to be viewed by many as a key benefit of SOA due to the reuse promised (falsely in my opinion) by the Layered Service Model approach. Thank you to all those who attended the .NET Community of Practice session on Thursday evening. For those who missed it, you can download the presentation slides here. In the realm of systems that manage a persistent store of some kind (for example a database, a queue, a topic or a file system), a transaction is defined as being an atomic (indivisible) unit of work. The transaction manager ensures that all data manipulation operations that occur as part of a transaction complete successfully or not at all. Consider the classic example of transferring money from one account to another. This operation involves reducing the balance of one account as well as increasing the balance of another. It is critical that either both operations succeed or both fail. For only one to succeed would leave the persistent store in an inconsistent state. Transaction managers also provide features to manage concurrency - that is multiple simultaneous transactions occurring in parallel. Without such mechanisms in place, data inconsistency may result from effects such as race conditions. A race condition describes a flaw in a system where the sequence or timing of two or more concurrent transactions causes the data held in the persistent store to enter an inconsistent state. Considering our money transfer example again, a race condition could occur if two transactions simultaneously read the balance of the first account, deduct the transfer amount and then update account balance. So for example, let's say the account has a balance of $100 and we wish to transfer $10 to another account. Both transactions first read the current balance ($100), deduct the transfer amount ($10), and then update the balance to $90. Obviously the balance should be $80 after both transfer operations complete. Transaction managers prevent these conditions from occurring by enforcing isolation between transactions. This is most often achieved through the application of locks. In our money transfer example, the first transaction will apply an "update lock" to the account balance which will prevent the second transaction from reading the balance until the first transaction has completed. The final property enforced by a transaction manager is durability, which ensures that data is not lost or left in an inconsistent state as a result of a system failure. When a transaction manager starts up again after a failure, all incomplete transactions are rolled back. The transaction manager ensures that all successfully completed transactions are committed to durable storage. These properties of atomicity, consistency, isolation and durability are abbreviated as ACID properties. Sometimes it is necessary for these properties to be enforced across two or more transactional persistent stores. This is achieved by enrolling the transaction managers of these stores in a single distributed transaction. A two-phase commit algorithm is often used to support distributed transactions. However, as this approach may involve locking resources in the various persistent stores involved in the distributed transaction in order to preserve ACID properties), it is not appropriate to be used across service boundaries. Services are autonomous and as such cannot be relied upon to complete operations within a reasonable period of time. We cannot allow the resources of one service to be locked while waiting for another service to signal whether it has successfully or unsuccessfully completed its operation. That being said, distributed transactions are extremely useful within the service boundary. Consider a service that persists its state in a database, receives messages off one or more queues and/or topics, as well as sends and/or publishes messages. Quite often, a service will perform some updates in one or more databases, and then send or publish one or messages in response to receiving a message from a queue or topic. If a failure occurs anywhere during this process, we want to ensure that we don't lose the inbound message, all database updates are rolled back, and we don't have any outbound messages escape. This is achieved by way of enrolling the queue or topic from which the inbound message was read, any databases where the service performed updates, as well as any queues or topics onto which messages were sent or published during the operation into a single distributed transaction. Any message read off a queue or topic is placed back onto the queue or topic as a result of failure, any outbound messages are erased and all database updates are rolled back. So this gives us a great deal of robustness when it comes to handling failures that occur as part of a single operation within a service. But what about workflows that occur across services? If one part of a workflow fails, we very likely will need to take appropriate action in other services involved in the workflow. This is known as compensation logic. Transaction managers deal with failures by rolling back changes that occur during a failed transaction. At the cross-service level however this action would not always be appropriate. Consider a Shipping service responsible for mailing order items to customers. If an action performed by another service as part of this workflow fails, we wouldn't want the Shipping service to erase all record of the shipment. The package has already been physically shipped. We can't roll that back! As a result of this, we manually implement logic within services to compensate for failures within other services as part of the same logical workflow. The appropriate compensation logic more often than not is a matter for the business to decide. The logic will be often different for every service and every scenario, so it must be explicitly defined in the business requirements. Different compensation logic may also be necessary as a result of different failure conditions. The need for manual compensation logic is considerably reduced with a self-contained process-centric service model. This flavour of SOA means that services hold all data they need to service any request locally. As such, all data updates are local to the service and can be protected by a distributed transaction inside the service boundary. So, ACID transactions are a fantastic tool to be leveraged within the service boundary to help us build services that are robust and tolerate failures. They should not however be applied across services. Here, we must rely on manual compensation logic. Recently, we discussed the use of idempotent messages as a strategy for achieving reliable message delivery over an unreliable transport such as HTTP. The goal of idempotent messages is to eliminate any side effect from receipt of duplicate messages so that the sending party can retransmit messages for which no receipt acknowledgement was received without fear of the retransmitted message causing problems at the receiver. The problem with relying upon idempotent messages of course is the effort involved in writing the retransmission logic for every endpoint sending messages reliably over an unreliable channel. It can also in some cases take quite a lot of effort to design and write systems that compensate for operations that are not naturally idempotent such that they become idempotent. As such, we want to leverage reliable transports where possible so we prevent idempotence and retransmission concerns leaking into our application logic. Reliable transports handle retries and eliminate duplicate messages for us as part of the communication infrastructure. Furthermore in situations where it is possible that messages arrive out of order (perhaps as a result of being routed by one or more intermediaries), reliable transports are capable of reordering messages such that they are delivered in the order in which they were sent. A problem with reliable transports however is that they tend to be platform specific (such as MSMQ, available only on the Windows platform). Fortunately a standard reliable messaging specification has been defined, WS-ReliableMessaging (WS-RM). This specification falls under the WS-* group of specifications. The catch though is that it is left up to the WS-RM implementer to decide what kinds of delivery assurances the WS-RM stack supports and will enforce. For example, the number of attempts a sending party makes to send a message before giving up is a matter of configuration at the sender. What the messaging infrastructure does with messages that fail to be delivered is out of scope for the WS-RM specification. Whether the receiving party holds out of order messages aside such that they can be dispatched to message handlers in order is matter of how the receiving WS-RM stack is implemented and/or configured. It makes no difference to the messages that are transmitted over the wire. The same applies for whether messages are placed in a durable store at the sender before being sent, or whether they are placed in a durable store at the receiver before being dispatched to the message handler. This makes sense if you think about it. There is no way that a service provider could enforce that its consumers store messages durably before forwarding them onto the provider. The best we can achieve is that the service provider and its consumers are able to make claims about delivery assurances. This is achieved with WS-Policy assertions. Although WS-Policy assertions have been defined for some delivery assurances, none have yet been defined to make claims about durable messaging. So we need to be aware when using WS-RM that either endpoint may or may not be storing messages durably. This means that if a service provider or consumer process crashes, a message could potentially be lost. Microsoft WCF does not support durable messaging with WS-RM at all. Durable messaging with WCF is achievable only by using the MSMQ transport. In my opinion, this severely limits the usefulness of WCF's WS-RM implementation. Another limitation of WS-RM is that it is not at present universally supported by all SOAP stacks as it is a relatively new specification. Where it is supported, there are no guarantees of what delivery assurances are enforced by the interacting parties. That being said, where reliable messaging is required between services on disparate platforms and WS-RM is available, it certainly beats a raw HTTP transport. Continuing my recent post on outsourcing business capabilities to third parties, I wanted to extend the example to include a Shipping service and a Billing service which outsources its billing function to PayPal. If you recall from last time, our online sales channel (part of the Sales service) was outsourced to eBay. When a customer places an order on eBay, eBay needs to inform us of the order details. We achieve this by setting up a local Web service which is invoked by eBay whenever an order is placed. eBay however does not guarantee delivery of this notification message. They do however provide a Web service we can interrogate in order to retrieve order details on demand. This involves a synchronous request-reply message exchange over an HTTP transport. PayPal also provides a notification mechanism whereby PayPal invokes a Web service hosted by our organisation. A notification is sent whenever a payment is processed. Unlike eBay, PayPal does guarantee notification delivery. Unfortunately, HTTP is not a guaranteed message delivery transport. Connection failures may occur. As a result, PayPal will keep sending the notification message until it receives confirmation that the message was successfully processed in the response from our Web service operation. If our response message back to PayPal is lost somewhere along the way, we'll end up receiving duplicate notification messages. So we need to make sure that the service logic that handles the notification is idempotent. We want to abstract away the details of these Web service interactions from other services in our enterprise. As far as the online sales channel is concerned, this is achieved by way of publishing a NewSaleNotification message within our organisation when we receive a sale notification from eBay via our Web service. The Sales service also stores a record of the sale in its database. The eBay notification however is not guaranteed to arrive, so we're going to have to find a way of dealing with that. Let's deal with that later though and look to the Billing service. PayPal sends us a notification which I'll assume will contain the order number and a payment number. When we receive a payment notification PayPal, we save the payment in the Billing service database and then publish a PaymentReceivedNotification. In order to protect ourselves from duplicate notifications, before publishing our PaymentReceivedNotification we first check to see if we already have a payment with the given payment number in the database. If it is already present, then we disregard the message. The Sales service needs to be subscribed to the "payment received" event. When it receives notification of this event, it checks to see if an order with the given order number is in its database. If not, it makes a request to eBay using the eBay Web service to retrieve the order details and then saves the order in the database. The service then stores a record of the payment against the order and raises an OrderPaidNotification. By virtue of the "order paid" event, we have abstracted away all the complexities associated with compensating for inadequate service level agreements of third parties. We can then subscribe the Shipping service to the "order paid" event (which would contain the full order and payment details) so that it can arrange shipment of the order once it has been paid. Note that with this architecture the contracts of the Sales and Billing services are devoid of any details concerning the third party organisations eBay and PayPal. This means we can replace these suppliers without impacting the remainder of our architecture. It also means we decouple our other services from the Web service contracts exposed by third party organisations. This is very important as we will have little to no influence on whether or how often these contracts change. The abstraction layer limits the impact of these changes to the boundary of the service interacting with the third party. One of the commonly cited benefits of SOA is it gives organisations greater flexibility in outsourcing business capabilities. This is by virtue of the fact that organisations can leverage Web services as a foundation technology for B2B communications across organisational boundaries. However one common misconception that exists is that a Web service interface that sits at the organisational boundary coincides with the boundary of a business service. This is in fact often not the case. Consider an online retail business that sells products via an online store. Let's assume that the business also accepts orders by mail (either by snail mail or email) and telephone. The Sales service would include the online store Web application, as well as some kind of internal application leveraged by call centre operators that process orders by mail and telephone. 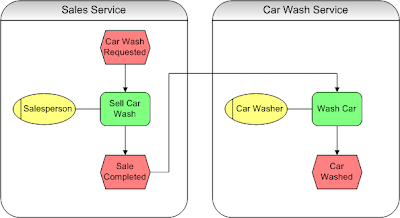 A possible Sales service architecture is illustrated below. So what happens if at some point the business decides it can get better value from outsourcing its online sales channel to eBay? Well clearly the entire Sales service has not been outsourced. We end up with an architecture similar to that illustrated below. Here we have a single service spanning organisational boundaries. The interaction between eBay and the components still hosted in house occurs inside the Sales service, but across organisational boundaries. The service contract of the Sales service remains unchanged. No other service in our business need know that the online sales channel has been outsourced. Just as importantly, no service is dependent specifically on eBay. If at some point we decided to replace eBay with another provider, this would constitute only a change in the implementation of our Sales service. Moreover, if we decided to branch out and leverage multiple third party online sales channels, this would involve only a change in the implementation of our Sales service. Just because eBay exposes a Web service interface as an integration point for retail businesses doesn't mean that we should expose that interface directly to our other services in our enterprise. eBay's Web service interface is designed as a point of integration. No more, no less. Business capabilities are unique to each business. Before outsourcing to eBay, our organisation had its own distinctive sales processes that evolved independently of sales processes in other organisations. Although there may be similarities, there will always be subtle differences. Furthermore, our organisation will wish to retain the ability to tailor and evolve its sales processes as it sees fit. The business certainly won't appreciate terms being dictated by eBay. We also want to be able to control the service level agreements (SLAs) (such as performance and reliability) upheld by our Sales service. eBay's Web service interface is based on synchronous request-reply interactions over an unreliable network (the Internet), effectively meaning there are no guarantees of availability or performance. Obviously we cannot expose other services within our enterprise to such poor SLAs. Something else to consider is that eBay's Web service interface is potentially subject to change. We need to shield our other services from such potential changes. As such, we certainly don't want to couple our services directly to eBay's Web service contract. Furthermore, what if we wish to outsource our online sales channel to a business that isn't quite so technologically savvy, providing an interface in the form of CSV files transferred via FTP? We certainly can't directly expose that as a service within our enterprise. What if we wish to partner with an organisation that offers only a REST based interface? The point I am making is that people get tempted to directly expose Web services (of either of COTS applications or partner organisations) to other services within their organisations, simply because they are Web services. Do not do this. The provision of Web services is entirely coincidental and solely a result of the need for interoperability. What is needed is a layer of abstraction between the partner organisation's Web service interface and the service contract exposed within our enterprise. This layer of abstraction gives our organisation the flexibility to have control over its sales processes and SLAs. More on this example in my next post, so stay tuned!